Part 1 focused on orthomosaic photogrammetry maps – our high-tech mapping service that delivers image files with embedded position and altitude information for each pixel. Another service that we provide – photomapping – uses a more familiar image processing technique known as photo stitched panorama. Although the photo collecting technique is similar to orthomosaic mapping, position and altitude information are tossed in favor of the less complicated panorama image processing. We use professional software to align features in the overlap areas, stitch the images together, and shade the transition zones. Panorama Software is Common, but How Does it Work? Panorama software works best when the camera is fixed and all images are taken from the same point in space. However, when using a moving camera the altitude must be high and a large overlap used. Therefore, we use the same flight control software and settings for photomapping that we use for orthomosaic mapping. Our photomaps have the same high resolution as orthomosaic maps, but avoid the expense of the mapping service for generating 3D map sets. 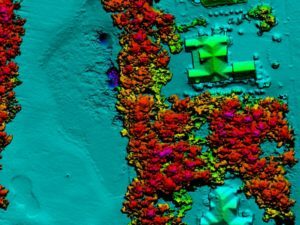 If position and altitude information aren’t required, then this is a less expensive way to get ultra-high-resolution maps of large properties. For example, take an acre of land, which is 43,560 square feet. When photographed at an altitude of 400 feet, one acre takes up 18% of the camera’s image. The area-to-image ratio is scalable, so an orthomosaic map or photomap of 40 acres can be covered with 8 images. The composite image size is then 145 megapixels (MP), with a resolution of 3.2 cm/pixel. The key word here is “composite,” since a large number of photos (e.g. 326 photos at 20 MB each) contribute to this composite image. Since a map’s image size is proportional to the number of acres, we can estimate your finished map’s image file at 6 MP per acre. This number can grow 20% or more because we’ll always be photographing a larger tract than required. In terms of file size, the finished JPG image file will end up at about 3 MB per acre. When specifying a mapping job, clients just need to provide their tract boundaries and we’ll take care of the rest. We’ll determine the appropriate parameters, such as 85% overlap frame to frame, 85% overlap track to track, and flying altitude. Overlap is partly determined by the height of objects on the ground (such as trees) and seasonal variations (such as leaves). Our flight control software will use this information to generate the photo-taking commands to be used by the drone’s autopilot, which ensures the photo-taking process is accurate and repeatable. This is especially useful if the map needs to be updated for project progress or for seasonal variations. For our example above, a 145 MP image is too large to display on common photo viewers such as the MS Office Picture manager. However, it can be viewed with more advanced software such as Adobe’s Photoshop. Of note, we can resize large images so they’re viewable on your photo viewer, but the resolution will have to be decreased. How Much Will Map Services Cost? Every job has its own unique requirements, so we don’t publish our prices. However, our prices are very competitive and we deliver an excellent value. We’re happy to take your map requirements and give you an estimate within 24 hours. We guarantee our work will meet or exceed your requirements. Call or e-mail. We’d love to hear from you! 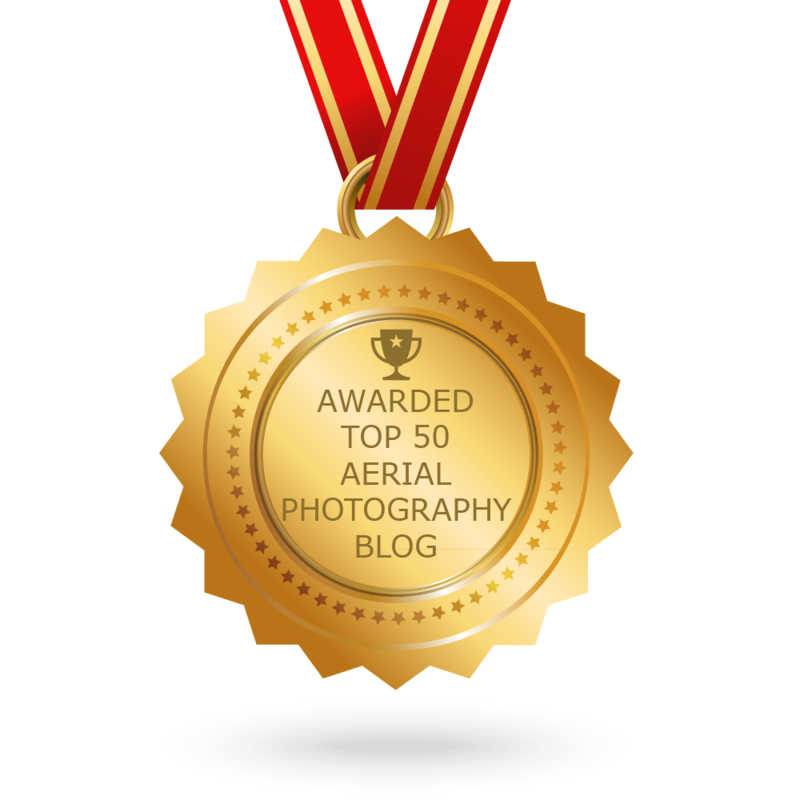 Aerial Drone Photography is the Ideal Technology for Orthomosaic Mapping and Photomapping! In this article, the term orthomosaic mapping is used to describe the orthomosaic photogrammetry mapping technique, which is a computationally-intense method that yields position and altitude information for each pixel in the map. The term photomapping is used to describe the use of photostitching software to generate large panoramic maps. Our orthomosaic map deliverables include: ultra-high resolution 2D maps, 3D Digital Elevation Model (DEM) topographical maps, 3D models, and 3D point clouds. Our Photomap deliverable is a 2D map image similar to Earth-type maps but with ultra-high resolution. As implied, “high-resolution” means these map image files can be very large – on the order of 3-4 megapixels per acre. For example, an 80-acre map will have around 300 MP and a JPG image file of around 160 MB. Large files for sure, but the terrain detail is amazing! Who Can Use Orthomosaic Maps? 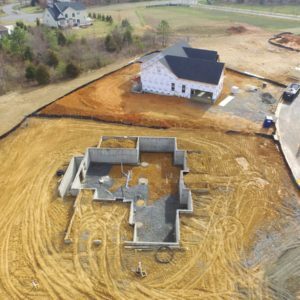 Surveyors, Architects, and Civil Engineers are several of the many professions that use orthomosaic maps for their land development and construction projects. They have the budget for high-end software, which can further process our orthomosaic map products. 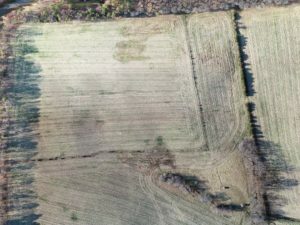 Real Estate marketers and landowners may also need high resolution maps but don’t want to make the significant investment in photogrammetry software. For these users, we offer photomaps, which provide beautiful full-color map images. More on photomapping in Part 2. Either way, these maps have high enough resolution to detect very small features. For example, a 1 foot by 1 foot object is represented with around 100 pixels. Tract size can range from less than one acre to thousands of acres. What Makes Aerial Drone Orthomosaic Maps So Special? Three dimensional computing is at the heart of calculating position and altitude information for each pixel. The numerically-intense software that does this, to my knowledge, hasn’t been made available for personal computers, so most users have to use online mapping services. For more detailed information on how this specialized software works, please refer to this article at ScienceDirect.com. Orthomosaic mapping software requires many photographs of the landscape so each pixel gets multiple look angles. The software then assigns position and altitude information to each pixel. As you might reason, this is a very complicated process. To get good results, very high overlaps of the subject area are required – on the order of 75 to 90%. This requires that each ground point is photographed 16 to 100 times. Aerial drones with precise GPS-based navigation are ideal for photographing landscape with this kind of precision. Hundreds or even thousands of high-resolution photographs are taken, typically looking straight down, and stored on the drone’s internal memory card. Back at the office, these photos are then uploaded to the mapping service and reconstructed by their orthomosaic software to create stunning, full-color maps, DEM maps, 3D models, and point clouds. To achieve good results, the drone’s altitude must be around 4-5 times the altitude of the highest object, such as trees. The algorithms work best when there’s low wind and lots of leaves on the trees. Water can be a challenge due to its reflectivity. With less-than-ideal photography, the algorithms have difficulty assigning position and altitude information to the pixels. If done incorrectly, the resulting map either has strangely-shaped areas or areas that are blanked out. 2D Map – full-color image of the landscape, including position and altitude information. Digital Elevation Model – color-coded for elevation, any color scheme is possible as well as contour lines. 3D model – full color three dimensional image. The model can be viewed on-screen from any perspective. Point Cloud – typically viewed with high-end software. It’s a full color 3D model using points. In part 2, we’ll examine photomapping, which will be of particular interest to real estate marketers and landowners.